The Cub Cadet Zero Turn is a riding lawn mower used in commercial and residential environments to groom lawns. 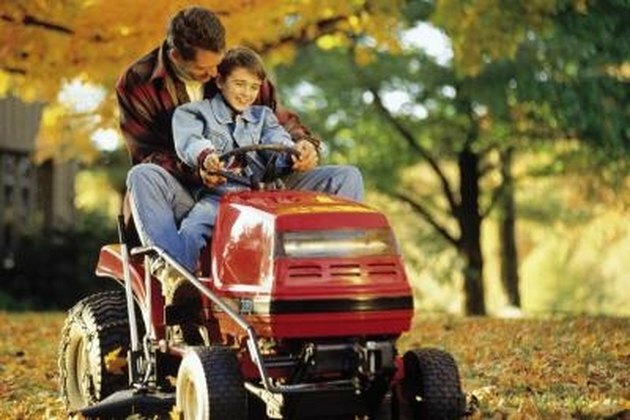 The mower is called a Zero Turn because it does not have to change directions when it turns. If you are having problems with your Cub Cadet Zero turn, you might feel the need to take it in to a service shop. You may not need to hire a technician, however, to get your Cub Cadet Zero Turn working again. You can make minor repairs yourself with little hassle. Get you Zero Turn working again by troubleshooting common issues. Make sure that your PTO/Blade Engage knob is not engaged. This is located on the side of the mower. Turn the knob to the disengaged position in order to start the mower. Engage the parking brake. If the parking brake is not engaged, your engine will not be able to start. It is located on the right side of the mower. Pull the choke knob on the mower until the choke is in the full position. This will allow the engine to start running. Make sure that your engine is not flooded. If your engine is flooded, try to start the engine in the "Fast" position on the gearshift. Check the fuel level. Something as simple as an empty tank can be the source of your problem. Open the hood and check the air filter. The air filter is located next to the engine and is labeled "air filter." Remove the air filter from the air filter housing. Clean the air filter by hitting again your palm to jar loose dust and debris. Change the air filter if you see any tears or rips in the paper material. Find the oil tank and take the cap off. The oil tank will be labeled "Oil Tank." Fill the oil tank with oil and then replace the cap. Adjust the deck corner gauge wheels if your Zero Turn is not riding smoothly. Look at the distance between the front gauge wheels and the ground. If you notice that the gauge wheels are touching or about to touch the ground, they need to be adjusted. There should be 1/2 inch above the ground. Use a wrench to remove the lock nut from the front gauge wheel shoulder screw. This located on the mower deck connecting the gauge wheel housing to the mower deck. Insert the shoulder screw into a different index hole to adjust the height of the gauge wheel. make sure that the gauge wheel has about 1/2 inch of clearance to the ground. Tighten the gauge wheel's lock nut to secure it to the mower deck. Perform Steps 1-4 on all of the gauge wheels until they are equal in height from the ground. Place the mower in the "Off" position and then engage the parking brake. Take the ignition key out of the mower and put on a pair of heavy gloves. Use a jack to raise the front of the mower deck to about 1 foot and then use wooden blocks to hold the mower in place. Wrap an old rag around one end of the mower blade to prevent it from turning. Use a hex wrench to remove the hex nut holding the blade in place. Remove the blade from the mower. Place your new blade on the mower and then secure it with the hex screw. Lower the deck from the jack and remove the blocks from the mower. Start your mower and test the blade on your lawn.